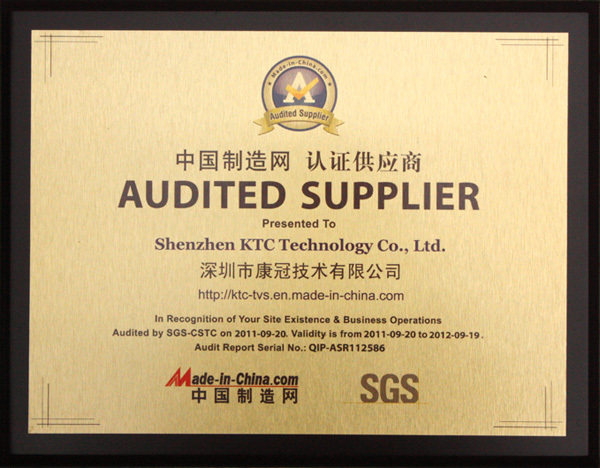 Recently, KTC was awarded “Audited Suppliers” which is issued by Made-in-China.com together with SGS. This certification is effective from September 20, 2011 to September 19, 2012 and the number is QIP-ASR112586. We have passed the examination and verification of SGS and been awarded “Audited Suppliers” consecutively since 2008. Audited Suppliers is a standardized field audit service launched by Made-in-China.com together with SGS, the third party certification authority, in January, 2007. We can gain certification from SGS by their filed audit by “Audited Suppliers” service. The certification contains investigation into some current situations, such as production and operation conditions, staff scale, and management process, then SGS issued an audit report based on field audit. From then on, buyers from all over the world can know the true situation of our company without a filed inspection and just need to check the on-line audit report on Made-in-China.com, which will increase the trust from clients and improve success rate of cooperation.